The Emerging Leaders Program is an invited leadership program sponsored by the Graduate School. This program helps you learn from experts and fellow graduate students what it means to challenge yourself to be the best leader you can be. During the two and half day fall workshop, you’ll attend sessions about professional development and leadership skills necessary for entering a workplace characterized by a diversity of people, career opportunities, and ever increasing responsibilities. Participants will develop action projects on campus and in the community during the spring semester. The workshop, held off-campus during Fall Break, will assist participants with not only understanding professional goals and leadership styles, but also with gaining personal insights. Through personality inventories that provide information about leadership preferences and interactive sessions, you will leave the workshop with practical knowledge about yourself and your abilities to lead. Following the fall workshop, participants will have the opportunity to demonstrate their leadership skills through planning and implementing an action project. Whether you plan to pursue a career in academe, corporate, or non-profit worlds, learning more about yourself will strengthen the skills you already possess and help you bring into focus what you want out of life after commencement. During the intensive fall workshop, you’ll meet fellow graduate students from all disciplines on campus. Networking with your future professional peers will give you built-in contacts when you leave UGA. And you may just make some friends for life! Learning from others, teaching others, and looking to the next stage in your life – the Graduate School Emerging Leaders Program provides all this, and much, much more. Apply for this program and start preparing for your personal and professional futures today! Using your skills. . .
Each year, the Emerging Leaders work together to plan and implement action projects to enhance their own leadership skills and to give back to the university and local communities. Previous Emerging Leaders cohorts have undertaken projects to share their knowledge and skills with other graduate students and with young emerging leaders in the community. Read more about the Emerging Leaders program. The graduate coordinator should save the complete nomination packet in one Adobe Acrobat .pdf file, name it with the last name of student_department (e.g., milton_grad), and submit it as an email attachment to ELNominate@uga.edu no later than 5 p.m. on Friday, May 4, 2018. 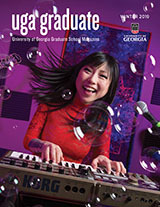 From admissions to graduation, the Graduate School promotes excellence in graduate education in all disciplines at the University of Georgia. By offering professional development programs and funding opportunities, the Graduate School enhances learning environments and inspires scholarly endeavors.